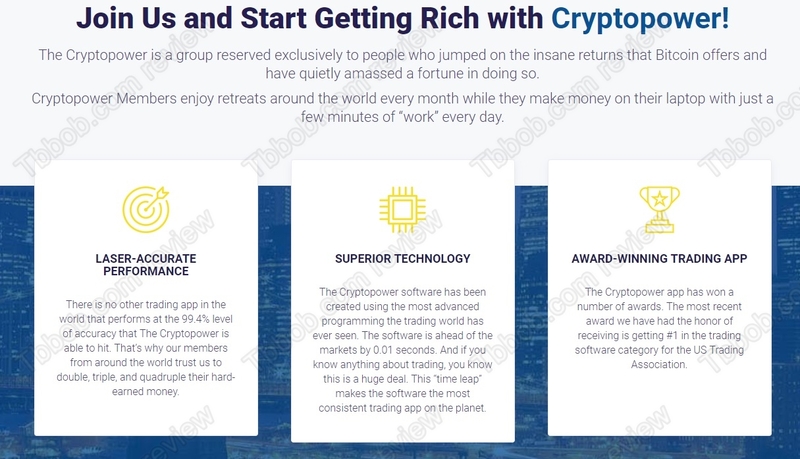 Cryptopower allegedly is an exclusive group that can make you money on autopilot in Bitcoin trading. The trading system allegedly has a 99.4% level of accuracy, which can double, triple or even quadruple your money (monthly?). The minimum monthly profit supposedly is $13.000. Even though Cryptopower is such an exclusive group, you can get in for free. Isn’t that strange? The truth is that Cryptopower is a rebranded old scam that we have already exposed in our review of Bitcoin Trader. And Crypto power isn’t the only clone of this scam, another one is called Bitcoin Trader Code. One of the clear sign that Cryptopower is a scam is in the promise they give you. No trading software in the world can have an 99.4% success ratio and a positive expectancy at the same time. This number alone proves that Cryptopower must be a scam. Then we have the fake testimonials that are being cloned with this scam, only the name of the program is changing. And we already proved that these testimonials are totally fake, because they were fabricated with stock photos. Check our picture to see a proof. To understand why do scammers bother and put out a losing software for free, you have to know that it is not really free. They will force you to deposit money with a non-regulated broker, until then you won’t be allowed to use it. You see, they get paid by that broker for referring new depositors, this is their motivation and source of income. But if you follow them and deposit money, you will lose it and never see it again. Cryptopower is a dirty scam that will make you lose money with a dirty broker. Stay away from it! If you want to trade cryptocurrencies for profits, try it first on a free demo account with a regulated broker. Then you will see how it works and what it takes to make real money.